When choosing a new entry door for your business, it is easy to get overwhelmed by all the types of doors you can choose from. Glass doors are a popular choice since they allow natural light to make its way into your building and invite passersby to get an enticing peek at what you have to offer. There are several different types of doors that incorporate glass into their design. Learn the best five types of glass doors to help determine which one is best for your business. Aluminum doors offer many benefits to business owners including low maintenance requirements, energy efficiency, great insulation, notable strength, and an industrial, modern look. Not to mention, aluminum is inexpensive. Glass gives aluminum doors a more inviting, aesthetically appealing appearance. 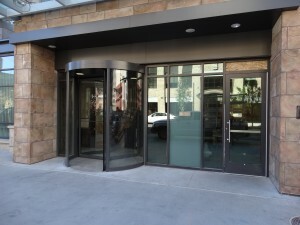 For businesses that get a lot of foot traffic, revolving doors are a great choice since they allow more people to enter and exit at a time. These doors also help keep energy bills low and loud noise out by eliminating the constant opening and closing of doors. Although a glass balance door might not look any different than most doors at a glance, they use an advanced system that allows even the largest, heaviest doors to easily open and close despite heavy wind. For a sleek look that allows customers a full glimpse into your business, choose an all-glass door. Restaurants, boutiques, and salons are a few business types that would benefit from this type of door. Stores located in indoor malls require unique door styles with large entryways and a clear view of what’s inside. Glass is the perfect material to use for the job! No matter what type of glass door you choose, Horizon Glass has the expertise and technology needed to make sure your business’ entryway looks amazing! Contact us today by calling 303-835-4399 to learn more about what services we offer.